Missionaries Bill and Kathleen Mann serve with Ethnos Canada – founded in 1942 as New Tribes Mission – focusing on church planting, translation, and literacy among the Simba-Guarani cultural group in Bolivia. Global Recordings Network’s (GRN) Saber players, digital hand-crank audio players, work as a perfect supplement to Ethnos Canada’s teaching of the gospel. The Simba are finally hearing the message of the gospel—not only in their own language, but in ways that apply to their real lives. Many of the elderly members of this group are far from literate, and some ministries seek to reach them through the Spanish language, which many of them don’t understand. The Simba culture must also be addressed for them to truly be able to understand the gospel message. Once the lesson is taught, Ethnos Canada’s teachers allow the older students to take the Saber players home with the lesson preloaded, so they can review it throughout the week. If a student shows real interest in the Bible and they aren’t able to meet with them regularly, they simply load up the Saber with the whole teaching series. And the influence of the Sabers in this community is undeniable. Now in his 70s, Placido was the first one of his community to believe in Christ about 30 years ago. Since then, he has been the primary leader of his community’s church. The problem, though, is that Placido cannot read. For a long time, the only testimony he could communicate was that he no longer participated in community drink fests or chewed coca leaves, which many churches in Bolivia view as sinful. But with the help of GRN, his faith has matured. Ethnos Canada gave him a Saber player, and years later, saw the results of that gift. One evening at a dedication of the Bible in the Simba language, Placido got up to share with everyone in attendance how he is no longer trusting in anything but the blood of Jesus for his salvation. 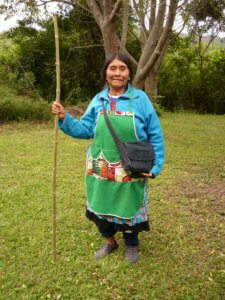 As shown with Grandma Marie, the group even made cloth bags for transporting and storing the Sabers. 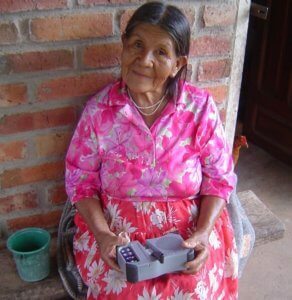 An elderly woman named Maria was one of the first in her area to receive a Saber player. During local church services, Bill and other church leaders will often ask attendees questions about what was just taught. Grandma Maria is often one of the first to offer her answer, and it is usually right on. An older Simba couple, Camilo and Teresa, live in a community where there is no Bible teaching in their language. Teresa calls the Saber her “teacher,” and after others in her community heard her listening to the lessons, they asked to borrow the player too. The player has since been “making the rounds” throughout the village. Ethnos Canada now reports that electricity is slowly arriving at most of the Simba villages, allowing a few more options for listening to the lessons — most notably CD players, radios, and cell phones with micro SD card capability. What is the Saber player? demonstrate how the Saber player works.